On Sunday, March 25, 2012, The Artinista Art Advisory along with Morton Fine Art hosted a wonderful conversation with passionate “Artnistas” about collecting fine art in Washington, DC. Colby Caldwell will discuss the current exhibition, gun shy, a culmination of Caldwell’s work from the past 10 years. He will explore the anatomy of the exhibition, how it was organized both conceptually and formally, and how the show echoes his dialog with photography in the 21st century. ART TALKS is free and open to the public. Seating is available on a first-come, first-served basis. The event is concurrent with Colby Caldwell: gun shy, on view through May 25, 2012.
it's a shame that beauty is temporal. You can see some of his additional works on display in association with the Serenity Players in the ARCH Development Training Center, Rm 104, located at 1231 Good Hope Rd. Tommie will also be one of the featured gallery speakers on Monday, May 28 from 11am - 2pm. 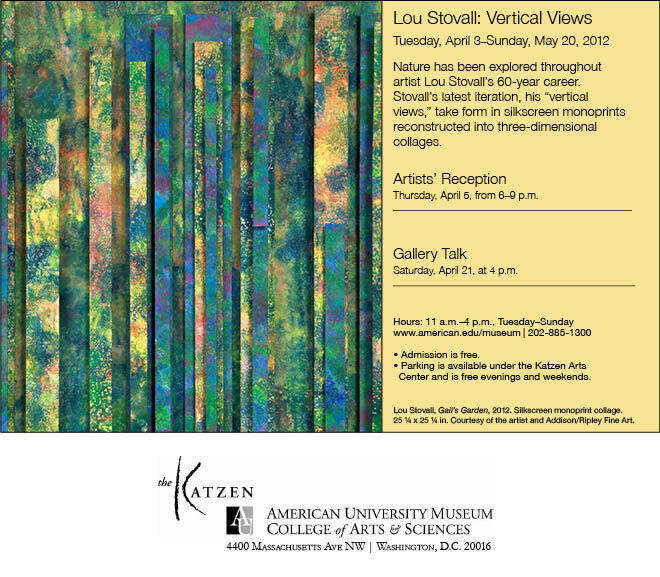 Stay for conversation after the talk while surrounded by the exquisite paintings of Jo Weiss. Jennifer Samet, Ph.D., is an art historian who authored the 2010 dissertation, Painterly Representation in New York,1945-1975 (The Graduate Center, CU NY). She has curated exhibitions on the history of the New York Studio School and on the Jane Street Group, written for The New York Sun and numerous exhibition catalogs. She was formerly the Director of the Center for Figurative Painting. She is the co-director of Steven Harvey Fine Art Projects, a gallery on the Lower East Side in NYC (208 Forsyth Street). WSS event is open to the public. Architect Enrique Norten explains why he relies less on inspiration than on a complex and analytical research-focused design process. See for yourself as the founding principal of TEN Arquitectos presents the firm’s recent work, including One York Street, and the Guggenheim Museum in Guadalajara, Mexico. Norten has also designed two striking new buildings for Washington, D.C.'s West End. G. Martin Moeller, Jr., the Museum’s senior vice president and curator, moderates a discussion between Norten and his client, Eastbanc's Anthony Lanier, about these projects and modern architecture in the nation’s capital. Realism and more from Washington, DC area contemporary artists. These artists work hard and have studied to develop great skill in creating realistically recognizable elements of their work. These works move beyond manipulating the surface and work to trick the eye bringing realism out of the two dimensional world. Find the work of Simmy Pell, Rachel Kerwin, Johanna Rodriguez, Olivia Rodriguez, and Patrick Kirwin on display at 5710 Baltimore Ave., Hyattsville, MD. 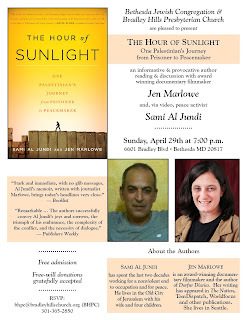 Reading and discussion: "One Palestinian's Journey from Prisoner to Peacemaker"
MPAartfest 2012 Call for Entries! Sunday, October 14nd at the 6th annual MPAartfest. Celebrating the centennial of Japan's gift of cherry trees to the nation's capital, this exhibition features one of Japan's most renowned cultural treasures, the 30-scroll set of bird-and-flower paintings by Ito Jakuchu. Titled Colorful Realm of Living Beings (J. Doshoku sai-e; c. 1757–1766), these extraordinary scrolls are being lent to the National Gallery of Art by the Imperial Household. Their exhibition here—for one month only—provides a unique, once-in-a-lifetime opportunity: not only is it the first time all 30 paintings will be on view in the United States, but it is also the first time any of the works will be seen here after their six-year-long restoration. 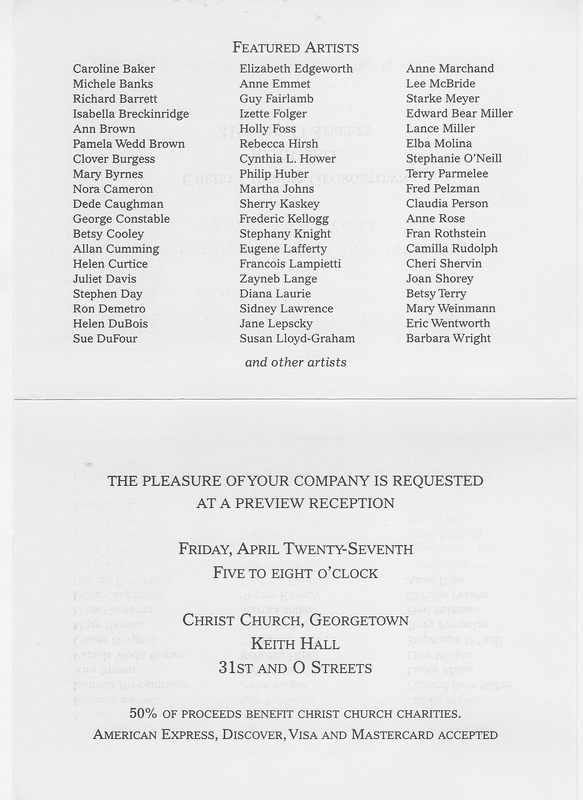 On Monday, May 7, 2012, the D.C. Commission on the Arts and Humanities will launch their 2013 grants cycle. Last year was the inaugural Grants Kickoff. Once again, they want to bring as many of you as possible under one roof to hear about what they have in store for FY 2013. From panels to changes in grant structure, there's plenty in store. There will be plenty of space, but for an accurate count, sign up soon and spread the word! 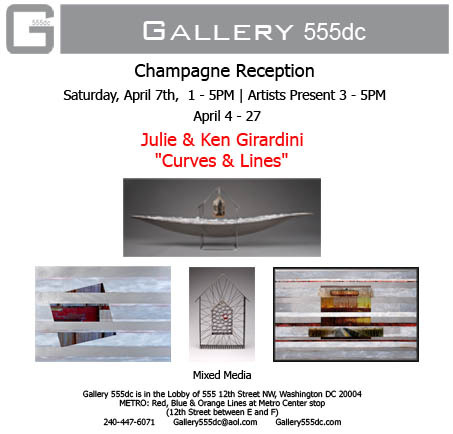 Opening Reception: Saturday April 28, 6:30-8:30 p.m.
Jacqueline Levine, Marco Rando, and Ming-Yi Sung Zaleski. Enjoy a night of culture also on April 28: Out of Place at 7:30 p.m. 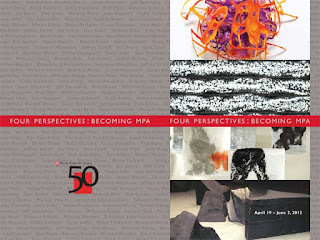 In honor of MPA’s 50th Anniversary, four past and present MPA curators — Andrea Pollan, Sarah Tanguy, Deborah McLeod, and Nancy Sausser — have come together to choose four individual exhibits featuring artists who have shown their work in the past in the MPA galleries. These exhibits will reflect MPA’s history as well as the strengths of the artists and the unique perspectives of each of the curators. Taken together, these four exhibits demonstrate the formation of the exceptional MPA exhibition program and acknowledge the efforts and influence of the fine curators who have made it what it is. Still passionate today about its mission to exhibit, educate and promote understanding of contemporary art, MPA has grown to become a critically acclaimed visual art center that serves more than 20,000 visitors each year. While traveling through South Western America, Miori Inata finds a connection and a distinct closeness to her Japanese roots. Though initially surprised by the primitive forms and colors found in the landscapes, the element of surprise has left Inata with a longstanding impression. Inata became deeply absorbed with photographing the beauty of the landscape; connecting to the energy of the ground beneath and the force above in the sky. The grandeur of the scenery taught her how nature can support and nourish human beings. 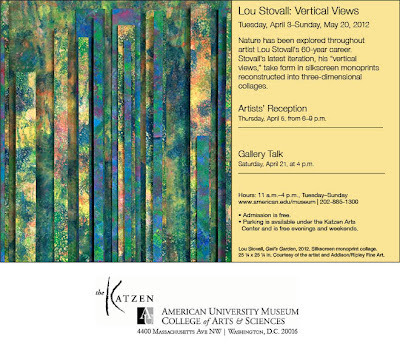 American Landscapes will be on display for the remainder of the month of April. 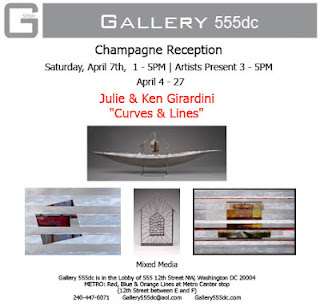 The 5x5 Project, the DC Commission and the Art and Humanities' citywide exhibit featuring 25 ground-breaking public art installations from artists from around the world, will be concluding on Monday, April 30th. The Commission has planned a tour of the exhibits for both media and the general public to catch the works before they come down. This 5x5 bus tour will begin and end at Arena Stage (1101 Sixth Street, SW) highlighting selected projects located across Southwest and Southeast DC. Please RSVP for the tour to this email address. Five national and international curators were selected to work with five artists each to create a public artwork ultimately producing twenty-five installations. These five curators lead the 5x5 implementation process and oversee each artist’s conceptual intent. The installations are of varying durations, but they will not exceed four months. For a schedule of 5x5 events, and information about participating artists and organizations, please visit www.the5x5project.com. 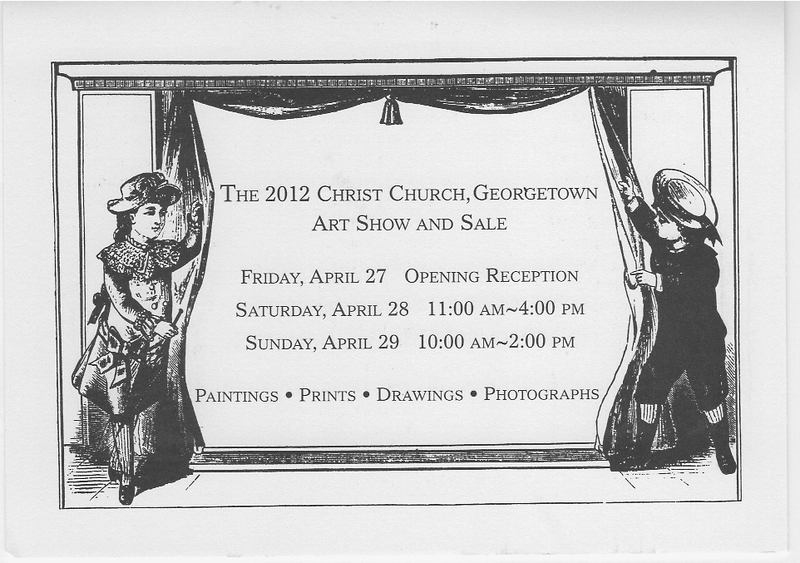 The Christchurch in Georgetown is holding a 3 day fundraiser this weekend. Last year funds were contributed to the Sitar Arts Center which provides a multidisciplinary arts education program to the children and youth of Washington, DC and to Josephs House in Adams Morgan. 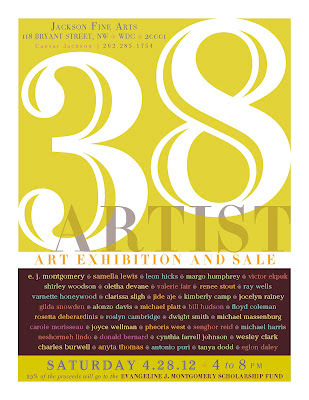 There will be 60+ artists exhibiting works for sale at affordable prices and 50% of proceeds will benefit Christchurch charities. The Jewish Museum is presenting Kehinde Wiley/The World Stage: Israel, featuring 14 large-scale paintings from the contemporary American painter Kehinde Wiley's newest series, The World Stage: Israel. The vibrant portraits of Israeli youths from diverse ethnic and religious affiliations are each embedded in a unique background influenced by Jewish ceremonial art. Also included are 11 works - papercuts and large textiles - chosen by the artist from The Jewish Museum's collection. All of the 14 paintings on view are being displayed in New York for the first time. A new acquisition by Wiley (born 1977, Los Angeles) served as impetus for the exhibition. There are inevitably bumpy times in the life of a creative. You know those curve balls that life throws challenging us to stay focused. When the going gets tough, I turn to author Eric Maisel for insights into the creative process. I am convinced that with understanding, moods can be trumped and replaced with creative action. Dr. Maisel is author of 35 books on a wide variety of subjects, including many on the challenges of the creative life. His insightful books offer a look into the creative process and personal meaning making. 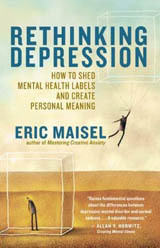 In his new book, Rethinking Depression: How to Shed Mental Health Labels and Create Personal Meaning, Dr. Eric Maisel invites depression sufferers and their service providers to consider whether human sadness has been monetized into the disease of depression, as he introduces practical tools for working with this common human condition. His book does two key things: 1) it disputes the prevailing view that depression is a disease and 2) it introduces a complete program for addressing human sadness. While Rethinking Depression takes on the “manufacturing” of mental disorders and the over-medication of our society, Dr. Maisel does not discount the real sense of sadness, frustration, exhaustion, and lack of motivation that have been rolled into a “diagnosis” of depression. However, he does challenge those who are dealing with it to acknowledge the reality of unhappiness as an inherent part of life, and to begin to take control of their well-being back from the medical establishment by having their own existential program in place for dealing with it. In part two of Rethinking Depression, Dr. Maisel turns his focus to practical advice for dealing with sadness and offers practical tools for taking as much control as possible of our thoughts, attitudes, moods, behaviors, and orientation toward life. “If you would like to try to live that strange, shining ideal — the authentic life…this is the program for doing so,” writes Dr. Maisel. I am very happy to welcome Dr. Eric Maisel as my special guest today. “The experience of unhappiness is not one you want to prolong or, if you can help it, repeat. How to avoid that? Work your existential program. You take as much control as possible of your thoughts, your attitudes, your moods, your behaviors, and your very orientation toward life and turn your innate freedom into authentic living." "Life is a project. One excellent way to deal with your life-as-project is the way that I’ve been describing: by following an existential program that focuses on your ability to create the psychological experience of meaning." Thank you Eric for your insights and for your passion in helping others to create a meaningful life. Eric Maisel, PhD, is a licensed psychotherapist and the author of Rethinking Depression and numerous other titles including Mastering Creative Anxiety, Brainstorm, Coaching the Artist Within, and A Writer’s San Francisco. He blogs for Psychology Today and the Huffington Post and writes for Professional Artist Magazine. Visit him online at http://www.ericmaisel.com. This 5x5 bus tour will begin and end at Arena Stage (1101 Sixth Street, SW) highlights selected projects located across Southwest and Southeast DC. Please RSVP to Mary Beth Brown at marybeth.brown[at]dc.gov with 5X5 BUS TOUR in the subject line and your phone number in the content of the message if you'd like to attend. 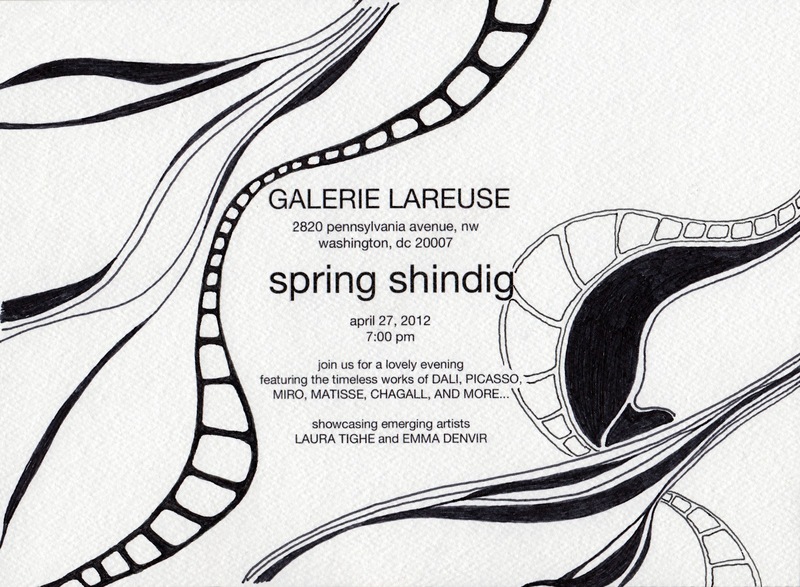 Opening Reception: April 27th at 7pm. Artwork by Laura Tighe and Emma Denvir. Friday, April 20, 6:00-8:00 p.m.
“FROM THERE” is a portfolio of memories by a Palestinian artist, an attempt to interpret the known versus the unknown of finding home, self, identity, and the challenge it presents in the creation of art. The content and narrative behind each piece explains her Palestinian origin. She uses textured surfaces to convey memory's persistence and perseverance. In some cases she incorporates words from the Quran to capture the wisdom and power of the verses and to communicate their imaginative energy. "Two Views/One Vision: The Paintings of Richmond Jones and Christine Osada Jones"
Christine Osada Jones states "art has always been the focus of my professional career." She started out as a beginning illustrator and went on to designing visual merchandising elements. She says she was fortunate to have creativity as her companion over her 20 plus years as the supervisor of the Chicago Public Library's graphics and exhibition design department. Her full time fine art career began in 2000 when she began exhibiting along with her husband in two-person exhibitions. Her works done in oil pastel represent the textures and colors, people and places in which she finds inspiration and have been exhibited in numerous group shows in Illinois as well as on the West Coast. Richmond Jones enjoyed a lengthy graphic design career working in New York as an art director for several prestigious companies. He established Richmond A. Jones Graphics in Chicago in 1970, operating a graphic design studio successfully for thirty years. In 2000 searching for a new creative direction he began his career as a transparent watercolor painter. Since then Richmond 's work has been exhibited in numerous juried exhibitions around the country and he has received many awards. His work is in private collections throughout the United States . Opening Reception, Saturday April 28, 6:30-8:30 p.m.
“I’m not sure if I paint in my pajamas or sleep in my clothes,” says Dana Ellyn, who is consumed, delighted and absorbed with the process of painting. Art is her way of telling stories with themes as varied as mythology, religion, feminism, politics and the American Dream. Dana’s paintings are at once playful, morbid, endearing, ironic, menacing, and intoxicating. All of these emotions are released as a liberation in her work. She plays the role of social realist, caricaturist, satirist and expressionist in her visually arresting canvases, often referencing artistic and cultural motifs as varied as Alfred Hitchcock, Picasso, Fairy Tales, Mexican Folk Art and Charlotte’s Web. There is a lexicon of iconography to the work of Matt Sesow. Bunnies, breasts, scars, airplanes, teeth, angels and dogs all recall an aspect of the artist’s past and emotional life. His work is authentic and humanistic, referencing the ideas of artists such as Jean Dubuffet, Keith Haring, and Jean Michel Basquiat, in the style of Art Brut. Matt paints to make visible his inner turmoil, social commentary and pure pleasure of expression. The allegory in Matt’s paintings evolve from his own personal trauma and his many travels through countries such as Spain, China and Costa Rica. Matt is a self taught painter who uses his art for both political expression and to convey the suffering of the disenfranchised. HIs paintings are powerful, savage and intuitive. Sharing the private collections of a select and diverse group of DC's leading contemporary art collectors through special receptions, Transformer’s annual spring Collector's View series highlights the relationship collectors have with artists, the role they play in building artists' careers, as well as their impact in creating healthy arts communities. Through the generosity of several leading DC contemporary art collectors, and with the sponsorship support of J.P. Morgan and Washington Life Magazine, Transformer invites Collector's View participants into some of Washington's best homes for personal "views" of a diverse range of private art collections. Participants will be privy to learn, from an insider's perspective, the motivations, interests and passions of these dynamic collectors on works they collect. Light fare and libations will be served at each event. Participation in this special series is limited. To register, please contact Stephanie Kwak at stephanie[at]transformerdc.org or 202.483.1102. Online registration is also available at transformercv.eventbrite.com. See Collectors View 2012 for more information. Reception and Curator’s Talk: April 19, 7 – 9 p.m.
Panel Discussion with Curators: April 26, 7 – 9 p.m.
A four-part group exhibit, curated by Deborah McLeod, Sarah Tanguy, Andrea Pollan, and Nancy Sausser. 50th Anniversary Exhibit at the McLean Project for the Arts includes the work of mid-Atlantic artists - a celebration of the exhibition history of this curated space. 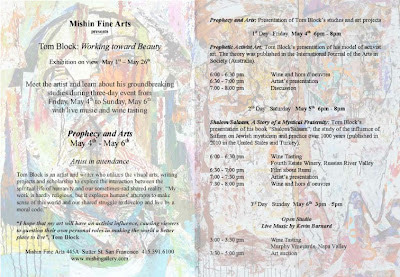 Dr. Eric Maisel will be visiting us here at Painterly Visions Blog on April 22. Eric is author of over 35 books including Coach­ing the Artist Within, Cre­ativ­ity for Life, Fear­less Cre­at­ing, The Van Gogh Blues and Mastering Creative Anxiety. His new book, Rethinking Depression, will be the topic of discussion on Friday. Eric will give valuable insights into creating meaning in our lives. Stay tuned. Toward its mission of furthering premiere international collaborations, the New York Opera Society and the Embassy of Spain present Sounds of Catalonia to celebrate masterpieces by Picasso and Miró at The Kreeger Museum. In addition to featuring the beautiful, contemporary cycles El Combat del Somni and La Memoria de les Canelles from the Society’s composer in residence, Ricardo Llorca, the concert will offer select masterpieces by important Spanish composers. The music will be interpreted by renowned baritone Gustavo Ahualli, guitarist Giuliano Belotti, and soprano Rosa Betancourt and pianist Rosa Torres‐Pardo. Tickets: $35, includes a light reception with the musicians following the performance. The Maryland State Arts Council announced that a new audio tour is now available to visitors of the 9/11 Memorial of Maryland, which was unveiled last September on the 10th anniversary of the attacks. The audio tour, which is intended as a cell phone tour to accompany visitors to the Memorial, educates listeners on the history of 9/11, explains the history and aesthetic design of the Memorial, and provides information on the 9/11 exhibit within the World Trade Center at the Top of the World. The free audio tour may be accessed by dialing (410) 767-7911. Located on the plaza of the World Trade Center in Baltimore’s Inner Harbor, the 9/11 Memorial of Maryland commemorates the extraordinary heroism, commitment, and sacrifice of the 69 Marylanders who lost their lives in the September 11th attacks. The 9/11 Memorial of Maryland provides a special site to reflect upon the events of September 11, 2001. The Memorial is a vital civic landmark, honoring citizens across our State while providing a public space for remembrance. Donations are still being accepted for the conservation and care of the Memorial. To learn more about the Memorial or to donate, please visit www.maryland911memorial.org. CRYSTAL CITY, VA — Registration is now open for artists and performers to display work at Artomatic 2012, the DC area’s biggest free arts event, being held from May 18 to June 23 in Crystal City at Vornado/Charles E. Smith's 1851 South Bell Street. Artists, performers, filmmakers, and creatives of all types may now register to participate in Artomatic at www.artomatic.org. Artomatic is well known for transforming empty spaces into vibrant arts communities that celebrate creativity and create a unique and exciting event for tens of thousands of visitors - all free to visit. Every night of the event, thousands of people visit Artomatic to discover new art, listen to music, go on dates, grab a drink, and mingle with the creative community. Artomatic features dozens of daytime art workshops for kids and adults. No matter what kind of creative events you enjoy, you’ll find something to like at Artomatic. For the latest information about the event, how to participate, and when to visit, subscribe to Artomatic by email or Facebook, and check the Artomatic website for updates. Glittering Machines is a solo exhibition of sculpture by Providence-based artist Paul Myoda. This is Myoda’s first exhibition at Project 4. Glittering Machines are modular, kinetic, interactive, sonic and illuminating sculptures investigating the human relationship with the digital world. Refuting the restrictions and disembodiment of the interfaces on our everyday electronic devices, Myoda explores ways in which computers can break from the limitations of the screen and interact with the physicality of the human body. By emulating natural behaviors, these works blur the distinction between the animate and inanimate realms. The National Gallery of art launched a new resource that revolutionizes the way the public interacts with its world-class collection. Users may now search, browse, share, and download free of charge more than 20,000 digital images believed to be in the public domain. This repository and the open access policy underscore the Gallery's mission and national role in making its collection available to scholars, educators, and the public. Learn the ins and outs of crafting a successful artist statement at this FREE hands-on workshop. The workshop will include a panel discussion with photographer and UCF professor, Brady Robinson and GWU Art History professor, Bibiana Obler. Participants will have the opportunity to receive feedback and make changes to a current (200 word or less) artist statement. 1606 20th Street Dupont Circle, 7 p.m. In December 2008, photographer Patrick Cariou filed suit against Richard Prince and Gagosian Gallery in Federal district court for copyright infringement in response to Prince’s appropriation of 35 photographs taken by Cariou without his knowledge or permission. Several of the works by Richard Prince were sold, some for as high as $2.5 million. The Court in New York ruled against Mr. Prince and stated that the appropriation of the Rastafarian images was not a “fair use” and therefore a copyright violation. The case is currently on appeal and many museums like the Metropolitan Museum of Art and MoMA have voiced support for Mr. Prince. If you have ever thought or cared about the changes occurring in the art world with mass media and the internet, please join artist John James Anderson, Nora, Alex, Kate, Lizzie, Leah, Nadia and Adah Rose Gallery for a lively and robust discussion on the merits of the case, appropriation art and ethics and legality in the art world. From Noon to Midnight, Anacostia will come alive with art, music and light. Over 100 visual artists, dancers, performers, curators and arts entrepreneurs will participate in this historic event. Just about half of the participants are either from Anacostia or from Ward 8. Run Dates: through Sunday 4/29. 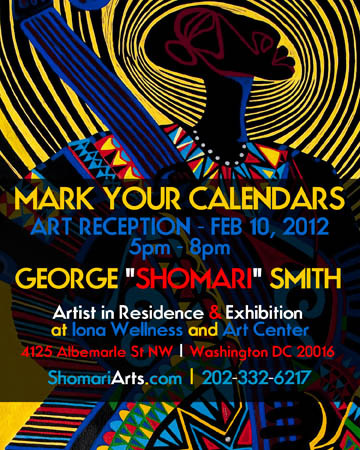 Address: Morton Fine Art presents *a pop-up project in Galley B, 7700 Wisconsin Ave, Suite E, Bethesda, MD 20814. Right across the way from The Original Pancake House! Bill Mould's unusual use of ceramic sculpture evokes myths and mysteries, often with sly humor. Open Saturday's 12-6, or by appointment. Call for directions 202-783-2963. 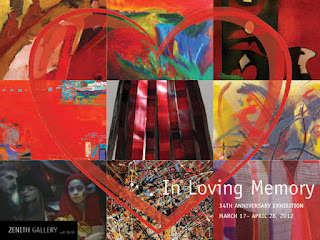 Zenith Gallery's In Loving Memory Exhibition is dedicated in loving tribute to Judith Keyserling. Ten percent of the sales will go to the Zenith Community Arts Foundation, a fund in honor of Judith Keyserling, to continue the programs she had worked on for the last 6 years. ARTISTS: Kim Abraham, Fabiano Amin, Rosetta D'Berardinis, Harmon Biddle, Deborah Brisker Burk, Renee duRocher, David Glick, Ken &amp; Julie Girardini, Margery E. Goldberg, Diane Britton Dunham, Stephen Hansen, Christine Hayman, Phil Hazard, David Hubbard , Robert C. Jackson, Shelley Laffal, Carol Levin, Lou Kaplan, Katie Dell Kaufman, Peter Kephart, Joan Konkel, Chris Malone, Anne Marchand, Joey Manlapaz, Michela Mansuino, Michelle Marcello, Donna McCullough, Bill Mead, Davis Morton, Carol Newmyer, Joan Samworth, Ron Schwerin, Sica, Ellen Sinel, Karen Starika, Paula Stern, Bradley Stevens, Charles Taube, Paul Martin Wolff, Marcie Wolf-Hubbard, Kenneth Wyner, Joyce Zipperer and more. Zenith Gallery at Chevy Chase Pavilion Closed for Renovations until May 7, 2012. 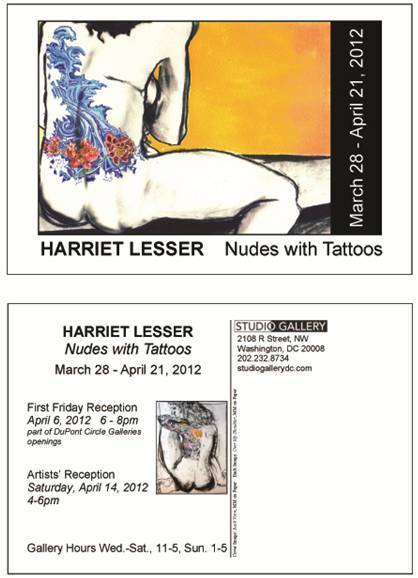 Please call anytime for an appointment 202-783-2963 zenithgallery.com. On Saturday, April 14, 2012, some of the brightest emerging and established researchers, activists, educators and artists from around the world will descend on the University of Maryland to present, argue, and tweet about the social implications of the Internet for the second annual Theorizing the Web conference. This event is open to the public with a minimum registration contribution of $1. 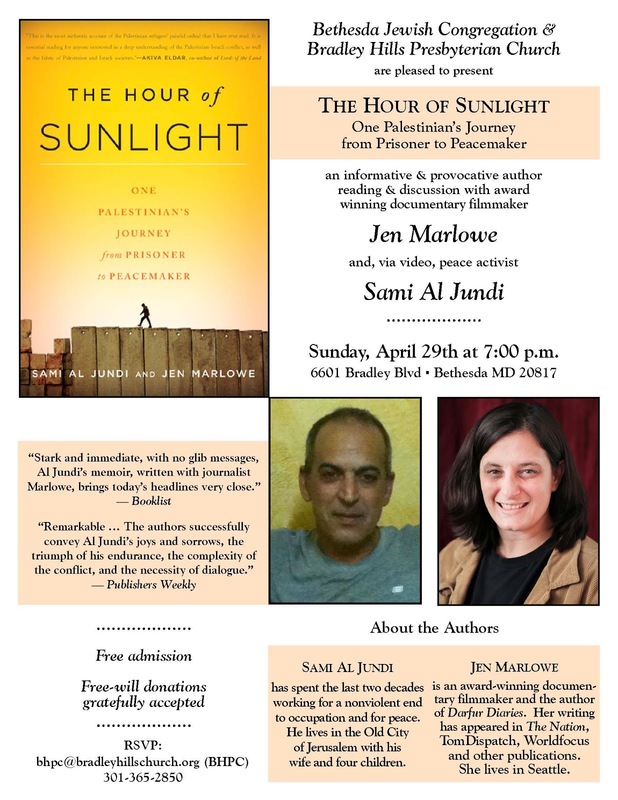 The daylong conference will be held throughout the Art and Sociology Building located on Campus Drive at the University of Maryland, College Park. Registration on the day of the event begins at 8am on Saturday, April 14th. D.O.L.L: DIWO OPNSRC LMFAO LHOOQ, is an exhibition of experimental and interactive new media installations that highlights the creative use, re-use and mis-use of technology by contemporary artists. 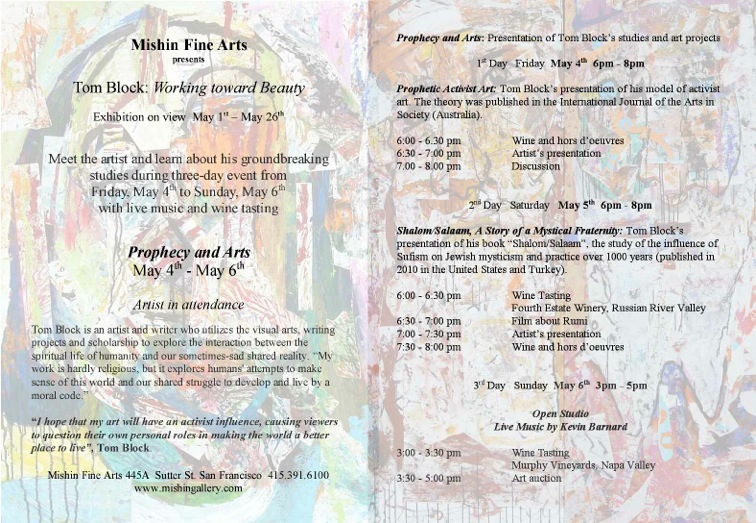 Exhibiting artists include Christian Benefiel, Jeff Chyatte, Eric Celarier, Blake Fall-Conroy, Mark Cooley, K. David Fong, Pete Froslie, Michelle Lisa Herman, Hiroshi Jacobs, Patrick Resing and Steven H. Silberg. Applications for three seasonal Washington, DC markets were posted online recently by Diverse Markets Management, LLC (DMM), a DC firm specializing in the development and marketing of outdoor public exhibitor markets. Fairgrounds, Opening Day, April 12First to launch will be Fairgrounds, a pop-up entertainment & shopping destination across from Nationals Park, on Opening Day of baseball season, April 12, 2012. Housed in eco-friendly shipping containers, Fairgrounds is a great example of "up-cycled" building materials, allowing for unique creative opportunities with minimal environmental impact.Located along Half Street between M and N Streets, SW, Fairgrounds will serve customers coming to the ballpark for games; for a lunch, happy hour and dinner spot seven days a week; and as a unique shopping destination of retailers and creative entrepreneurs, food truck restaurants, bars, entertainment stage and farmers market. DMM will be coordinating a weekly Wednesday jazz series and twice-weekly farmers market, both sponsored by the Capitol Riverfront Business Improvement District. The WellnessWORKS Farmers Market, produced by DMM in partnership with the US Government launches its 2012 season on Wednesday May 2. WellnessWORKS Farmers Market is located in the courtyard of the OPM Roosevelt Building at 1900 E Street NW in the Foggy Bottom neighborhood where I-66 becomes E Street. The market is intended to showcase and provide healthy foods and nutritional items and to highlight sustainability by featuring only locally grown or produced products. The market will operate every Wednesday from 10am - 2pm through October. Application and additional information can be found http://diversemarkets.net/events.asp?evid=12. Initiating its second season, the market is situated in Mt. Vernon Triangle, at the corner of 5th and Eye Streets NW just north of Chinatown in downtown DC. The market boasts a prime position in a growing high-end residential neighborhood near the Convention Center and popular restaurants such as Busboys & Poets. The market will feature a diverse mix of art, crafts, imports, antiques, collectibles and furniture every Sunday beginning May 6 from 10 – 4 p.m. The market will also highlight local specialty food items such as fruits and vegetables, flowers, preserves, prepared foods and beverages. In addition to some low-key live entertainment, seating for the community will be provided to enjoy this new neighborhood gathering place. Michelle Peterson-Albandoz is driven by a desire to shine light on the destructive relationship humans and technology have on nature as well as an aesthetic need to make pretty what others deem unfit. She scours her neighborhood of Andersonville in Chicago, Illinois searching for discarded wood, often rubble from renovations of decades old row houses. One man’s trash is Michelle’s treasure, as the scraps transform into the reclaimed wood and mixed media pieces for which she has become known. Washington, DC - Open Studios is an annual event that invites the public into the creative spaces of the renowned artist studios at 52 O Street. Visitors will have the opportunity to explore artists’ work spaces, meet a variety of artists and arts professionals from a range of backgrounds and disciplines, and to see and purchase artists’ most recent works fresh from the site of creation. Additionally, visitors will enjoy film screenings, a bike clinic, the store at SCRAP-DC, food from local restaurants and vendors, and more events to be announced. This year, Open Studios artists will include: Andrea Haffner, Becca Kallem,Bittersweet Creative, Capital Letter Press Studio, Cianne Fragione, Dan Treado, De*Nada Design, Derek Lieu, Drew Xeron, DJ Natty Boom, Eames Armstrong, GHOOM, Jane Claire, Remick, Jeffrey Smith, Jon Malis/TUBE Studio, Kelly Towles, Kendall Nordin, Lisa K Rosenstein, Lisa Marie Thalhammer, Maeve Sheridan, Malte Renz, Mann Designs, Matt Costanza, Matt Hollis, Matt Pearson, Micheline Klagsbrun, Monier Barakat, Peter Harper, Raye Leith, Robin Schaefer, Ryder Haske, SCRAP-DC, Stephen Crouch, Thom Flynn, Threepenny Bikes, and, Topher Paterno. For a sneak peak of Open Studios, please visit the annual group show of 52 O Street artists up the street at Big Bear Cafe, located at 1700 1st Street NW. Born 1958 in Philadelphia, Pennsylvania, the son of a NASA engineer, Philip Michael Wolfson studied architecture at Cornell University and the Architectural Association, London, England. After completing his studies he spent ten years as head of design for renowned London architect, Zaha Hadid until establishing his own studio in 1991. Wolfson has established his distinctive pathway, re-examining the forms and ideas of the early 20th century Modernist movements, particularly Constructivism and Futurism. In his first U.S. solo exhibition at INDUSTRY, Philip Michael Wolfson will exhibit a new series of Tsukumogamis, a type of Japanese "artifact spirit"--living inanimate objects. Tsukumogamis originate from discarded items that have reached their 100th birthday and thus become alive and aware. This experimental study uses Concrete Canvas, which has an innate organic quality and movement. Golden Triangle Business Improvement District, DC Commission on the Arts and Humanities and Washington Metropolitan Area Transit Authority and the WMATA Art in Transit Program are holding a dedication ceremony for a sculpture series created by DC artist, Michael Enn Sirvet, Farragut Spheres which will take place at the installations location (the entry of the Farragut West Metro Station at 17th and Eye streets NW, DC). It will be a short ceremony with Mayor Vincent Gray speaking, a few other DC and Metro dignitaries and the artist. 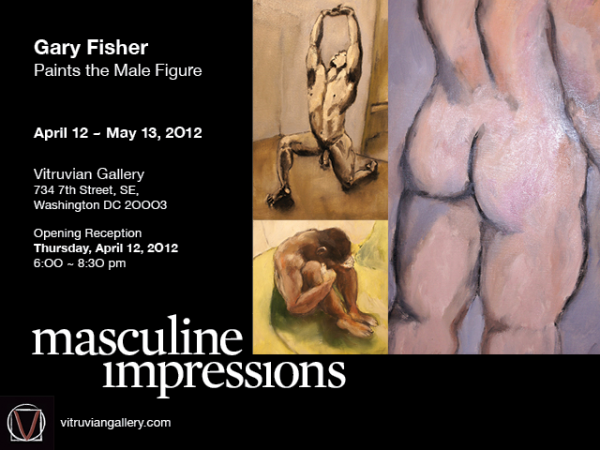 Opening reception: April 13, 2012, 6-8pm. Curator’s talk at 7 pm. To mark 20 years of operation, MOCA DC gallery in Georgetown is launching UPFRONT at MOCADC. The space will feature international juried shows of figurative art from classical nudes to contemporary interpretations of the figure in all mediums. The inaugural exhibition entitled You, Me and Everybody Else is juried and curated by Washington-based international artist and writer Lilianne Milgrom, and offers an impressive range of styles and mediums by artists from the United States, France and Israel. The show’s title alludes to the undeniable interconnectedness between people and reflects upon the infinite fascination with which we contemplate ourselves and those around us. WASHINGTON—In its 26th year, Filmfest DC: The Washington, DC International Film Festival continues its commitment of bringing new and award-winning cinema from around the world to the nation’s capital. Beginning this Thursday, April 12, and continuing through April 22, Filmfest DC presents more than 80 films from more than 35 countries at top venues in Washington, DC. A full list of films, locations and screening times is available on the Filmfest DC website, filmfestdc.org. On Tuesday, April 10, 2012 at 7:00 pm, MSNBC host Chris Matthews will discuss his new book Jack Kennedy: Elusive Hero (2011, Simon & Schuster) with the President of the IDB, Luis Alberto Moreno. Free and open to the public, photo ID required. Inter-American Development Bank, 1330 New York Ave NW, Washington DC, one block from Metro Center. Deadline Extension for Call for Entries for MPA's summer juried exhibition "Something and Nothing: Activating the Void"
This exhibition will bring together artists whose work deals with space, inclusion or absence. Many artists pay close attention to the “negative space” in their work, and often what is not included or that which is in-between is just as important as what is. For this exhibition, we are looking for works that explore this territory, either in a conceptual or formal way. Group showing by select WPG members all exhibiting prints inspired by the season in a range of techniques and aesthetics. Cultural symbols of success fetishized in commercial photography are used to create works that blur the lines between installation and collage in Rex Weil's solo show. The gratuitous signs of pleasure and success that drift daily through the mail slot— luxury catalogs, realtors’ brochures, and home renovation magazines— are the materials Weil uses to construct work that recalls Barthes’ Mythology. Through intuition, analysis and mordant humor Weil illuminates the discourse of repression, desire, exploitation and frustration percolating just below the surface of commercial photography. For the artist each shred of imagery is tantamount to an isolated bit of DNA from which the complete texture of our social and economic relationships can be surmised. Pumped up lips, gold chains and other fragments are removed from the systems that imbue them with power and isolated within a dialogue of desire, frustration and exploitation. 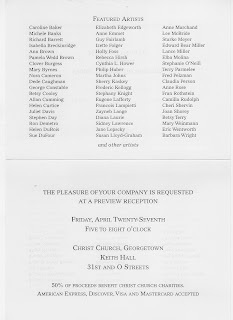 SATURDAY, APRIL 14, 2012, 6–8 P.M.
NEXT at the Corcoran: Class of 2012 is a dynamic, interactive, and innovative presentation of work by the graduating students of the Corcoran College of Art + Design. 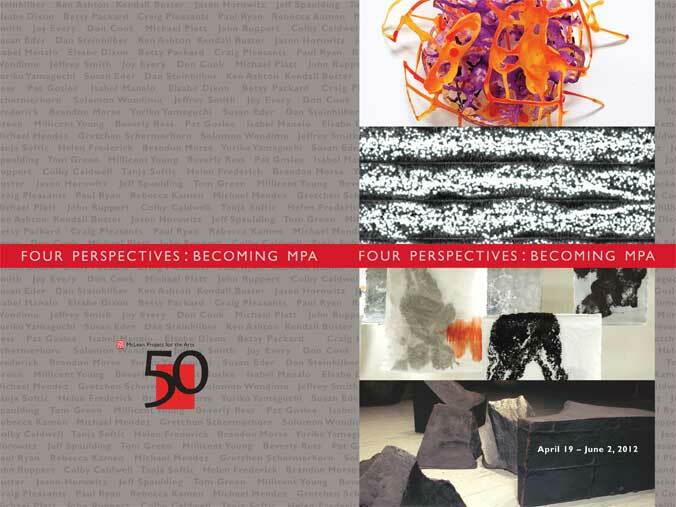 NEXT, for the first time, includes both an exhibition of the thesis work of the bachelor of fine arts class of 2012 and a showcase of the masters of arts degree programs at the Corcoran. For more than 120 years, the Corcoran has trained the next generation of artists—as well as art and design professionals—while displaying the most important works of the time. Celebrate the achievement and promise of graduating BFA and MA students at the Corcoran College of Art + Design as the Corcoran showcases what's NEXT. Visit www.smithcenter.org to learn more. FLUID: Rhythms, Transitions, & Connections, features the works of Francie Hester, Lisa Hill, and Rebecca Kamen, in collaboration with Susan Alexjander. FLUID tackles the oft-unexplored complexities of human existence and visually ponder questions relating to loss, memory, and our connections to nature and one another. The tragic passing of Brendan Ogg at the age of 20 from brain cancer was one of those moments in life that brought a family and a community together in search of a way to connect. The result is a unique artistic collaboration, Words as Legacy-A Leaf of Knowledge, created by Hester, Hill, Mattson Ogg and a community of knitters who came together to grieve and remember Brendan Ogg through the words and poetry he left behind. Lisa Hill follows up on the impact of words left behind, by examining the nature of human existence as represented in one of the most intimate expressions - a signature. SIGNINGS: Mother and Father charts the signatures of Hill's parents over the course of their lives and shows how identity is formed and altered by life's events and the ravages of time and health. Moving beyond the written remnants we leave behind, Francie Hester and Rebecca Kamen individelve into the abstract by exploring not the language that allows us to connect to one another, but rather neurological biology that enables us to connect to both our past and even nature. Francie Hester takes her inspiration from the NIH's ongoing mapping project of the brain's minute electrical currents, our connectomes. Together Hester, Hill, and Kamen explore the intangible realms of memory and human connectivity. CAMP Rehoboth community celebrates the opening of ABSTRACT. 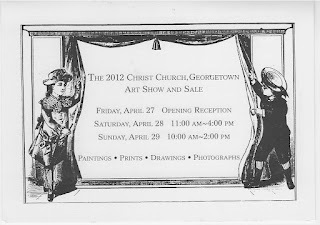 The exhibition will run from March 28 - May 17, 2012. 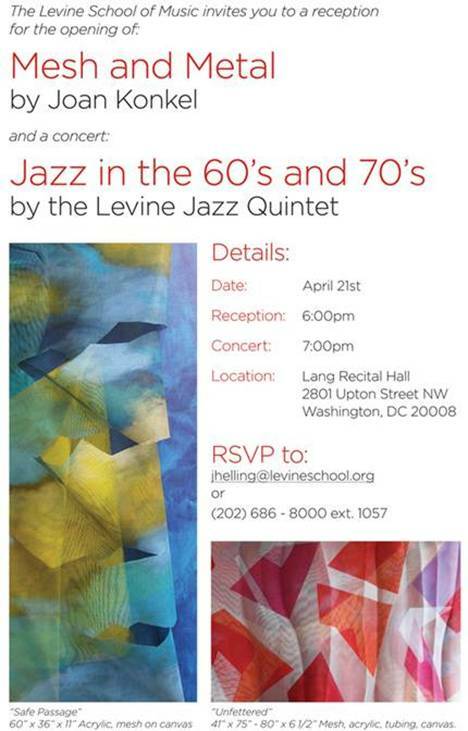 Friday, April 20, 2012 from 7 p.m. until midnight. This year, guests will join Honorary Patron His Excellency Francois Delattre Ambassador of France to the United States and Madame Delattre, along with Honorary Chair and internationally acclaimed artist Sam Gilliam, a past Corcoran College of Art + Design faculty member and advocate for arts education in Washington, D.C., and beyond. Additionally, a select number of tickets to Club Corcoran – an exclusive after-dinner opportunity to experience the grandeur of the Corcoran Ball at a lower price-point – will be offered from 10 p.m. to 1 a.m. A highlight in Washington’s spring social calendar, the black-tie benefit features uniquely decorated formal dining rooms in the Corcoran’s historic galleries; a lavish, three-course seated dinner; and a festive evening of music and dancing. Proceeds from the 57th Annual Corcoran Ball benefit the Corcoran Gallery of Art and College of Art + Design’s institutional programs and activities, including special exhibitions, scholarships for students, educational outreach, and more. Corcoran Gallery of Art and College of Art + Design, visit www.corcoran.org. Bethel Aniaku "Instinst of Desire"
Born on July 4, 1970 Bethel started drawing at 8 years of age. In the 1990's he became an understudy at the Bernard Art Studio in Bordeaux, France and later studied at the Academy of the Arts, Berlin, Germany. The cultural themes used by the artist in his paintings, include a blend of historical, literal, and artistic elements immediately recognizable, and in which each viewer returns magically to his own culture. He honors the trade of his carpenter ancestors by using wood as the base for his paintings. His inspiration comes from everyday experiences and life. "Painting is a continual research for me. I best capture present reality by using the abstract. My compositions play with color, light, space, and various materials. Day after day I slowly add a layer to my canvas trusting my instincts over any particular idea. In the end this process lets the true nature of the piece emerge." Mr. Aniaku was represented at the Francophonie 2011 Cultural Festival in Washington, D.C., he is also represented by the Contemporary Art Museum of Hiroshima, Japan; B.C.E.A.O. Bank, Dakar, Senegal; Tokyo Museum, Tokyo, Japan; The Smithsonian Institute, Washington, D.C.; and Mbari Institute; Washington, D.C, as well as exhibits in Germany, Belgium, Spain, France, and Italy. On display at MFA & *a pop-up project's show DC NOW, opening Wednesday 4/4/12 at Gallery B in Bethesda, MD. Including artwork by MAYA FREELON ASANTE, BILLY COLBERT, ROSEMARY FEIT COVEY, LAUREL HAUSLER AND VICTORIA SHAHEEN. Though still a student at Howard University, Wilmer Wilson IV has already staged successful performances at Hillyer Art Space and the (e) merge art fair in the district. Wilson will create a suite of performances based on the historic 19th century figure Henry "Box" Brown, a slave from Richmond, Virginia (the artist's hometown), who mailed himself to freedom in the North by paying to be shipped in a crate. For Henry 'Box' Brown: FOREVER, Wilson will cover himself with three grades of postage stamps and walk into post offices, asking to be mailed. Habitat For Artists has built small, temporary, 6 by 6 foot art studios made from recycled and reclaimed materials to engage local artists and youth groups to take an active role in participating both inside and outside of the habitat. Photography is about freezing moments to take with us. Whether these images land on the pages of the family photo album or shared with the world on Facebook, our best photos tell a story without words. The D.C. Commission on the Arts and Humanities (DCCAH) would love for you to share your 5x5 moments with them. While scouting each of the installations, snap fun and creative photos with your phone, tablet or camera and upload to the ArtAround (app available for iPhone and Android), a comprehensive and interactive map of all the public art in the District.